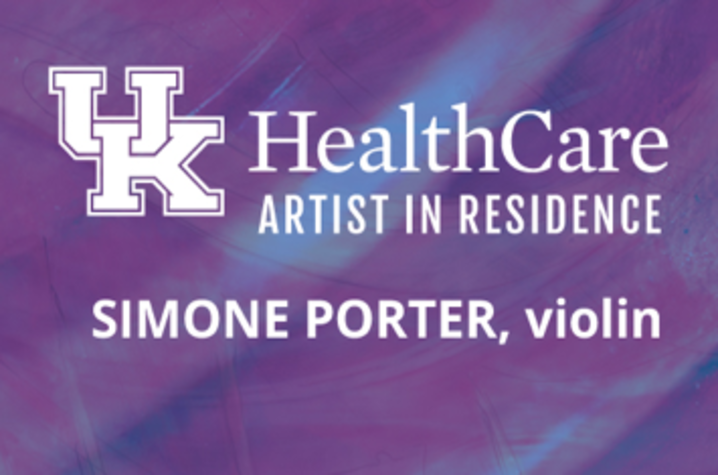 LEXINGTON, Ky. (April 5, 2019) – Simone Porter, UK HealthCare's artist in residence and soloist for the Lexington Philharmonic's 2018-2019 season series, will give a performance in the Albert B. Chandler Hospital atrium on Tuesday, April 9 at noon. This event is free and open to the public. She will also perform at UK's Hilary J. Boone Center on Wednesday, April 10 at noon. This event is open to the public, and the optional lunch buffet is $12.50 and begins at 11:30 a.m. The Lexington Philharmonic will feature Porter in their performance of Saint-Saëns’ Violin Concerto No. 3 on Friday, April 12th at 7:30 p.m. at UK's Singletary Center for the Arts. Tickets are $25. UK HealthCare employees receive 20% discount. Click here for ticket information. As a sponsor of the Lexington Philharmonic, UK HealthCare brings world-class artists to Lexington for performance and outreach as part of the UK Arts in HealthCare program.